Saint George is the patron saint of England as well as the namesake of our charity and its 248-year-old legacy. Schoolchildren are taught that he was a knight who slayed dragons but is there more to the historical figure? Saint George is thought to have been born into a noble Christian family in the late third century in what is now modern-day Turkey. As a soldier and officer in the Roman army, he refused to denounce his faith and persecute fellow Christians leading to his martyrdom in 303 AD. But what does this have to do with dragons? 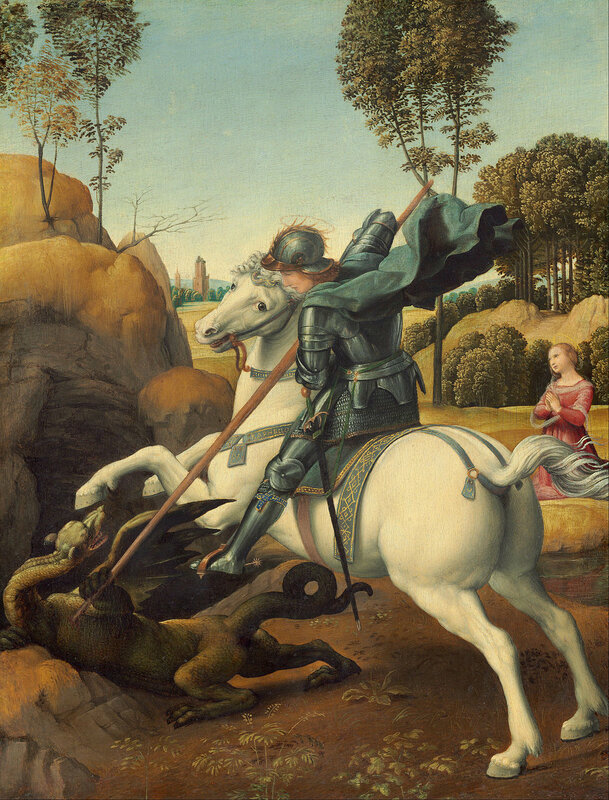 The myth of Saint George slaying the dragon originated in stories of his valiance and bravery brought back by the Crusaders who learned of him during the Middle Ages. Legend has it that George arrived upon a village where a dragon was terrorizing the local people. To appease the creature, they had begun to sacrifice a sheep per day to feed its hunger until they no longer had any sheep. The King then decreed that they must sacrifice the local children to keep the dragon at bay. Each day, the sacrifice was chosen by lottery until the King’s daughter was selected. As she was being led to the dragon, George happened by. Horrified by what he discovered, he offered to slay the dragon. During his battle with the dragon, George noticed a vulnerable patch of skin under its arm and charged forward with his sword, slaying the beast. The villagers held a huge feast in his honor and the feast day of Saint George is celebrated each year in tribute to his bravery. So how did this Turkish soldier become the patron saint of England? King Edward III made Saint George the country’s official saint shortly after ascending to the throne in 1327. Alongside England, Saint George is also the patron saint of Georgia, Malta, Portugal, Catalonia and Aragon in Spain and Romania among others. He is also the patron saint of scouts as well as representing farmers, shepherds and armorers. How is St. George’s Society celebrating? The Society was founded on 23rd April in 1770 at Fraunce’s Tavern in Lower Manhattan. Originally known as the “Sons of St. George”, members gathered in celebration of England’s patron saint and to establish our charitable mission to provide assistance to fellow countrymen in need or distress. This celebratory banquet has been held with rare exceptions every year on or near 23rd April ever since and is now known as the English Ball. This St. George’s Day, the Society will carry on the tradition, hosting the English Ball honoring Dan Glaser and Lady Weatherstone at the Mandarin Oriental in NYC. Our community partners will have a variety of fun offers available to help you show your English pride and celebrate in style…stay tuned!